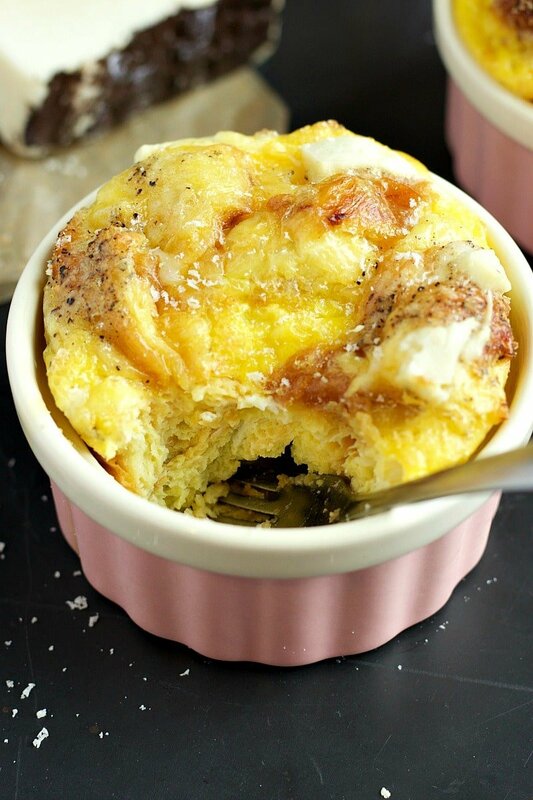 This Easy 3-Ingredient Egg Soufflé is quite simple to make and yet a delicious breakfast to wake up to! 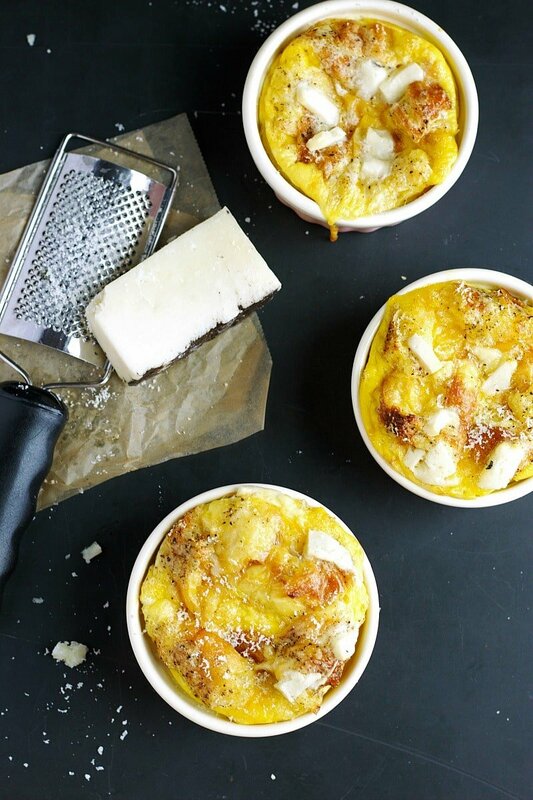 The dish consists of fluffy eggs with croissant crumbles golden to perfection and topped with flavorful pecorino. 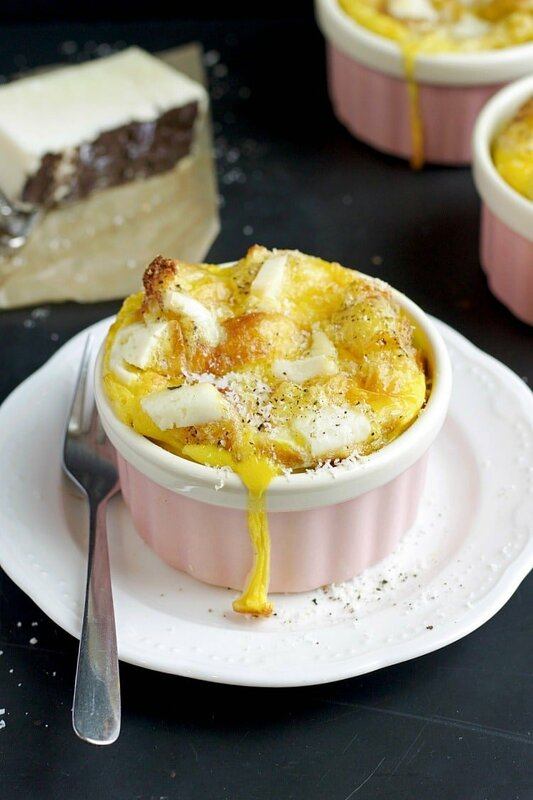 There is something about a cheesy egg soufflé paired with a cup of coffee that is a total game changer. I am talking about waking up on a Monday feeling like it’s Friday! If you never made soufflés, this is a great starter recipe because it’s easy and only require 3-ingredients. However, if this isn’t your first time I still urge you to try this simple yet flavorful combination. Blame it’s deliciousness on the croissant (or Pecorino?). Either way, it’s a tasty combination of a buttery croissant, fluffy eggs and salty pecorino. An irresistible, tasty and filling breaky for your mornings and meal prep candidate. When I make these egg soufflés I be sure there is at least a day or two worth of left overs. I keep it right in the ramekins and wrapped in plastic, toss in the refrigerator and when ready to eat again, steaming to heat is the way to go. But perhaps what I love most about this recipe is that I can quickly whip up a batch for a brunch-like breakfast that I can serve anytime. Even if during the busy weekdays! Now, off course you can add things like spinach, broccoli, roasted onions and peppers as these are all great toppings for a soufflé. However this recipe is simply delicious as is, and a good choice if you want to introduce soufflés to your kids, because it’s simple and cheesy, or if you are not sure about the flavoring preferences of your guests, this is a safe option to try! The dish consists of fluffy eggs with croissant crumbles golden to perfection and topped with flavorful pecorino. Pre-heat oven to 375F degrees. Spray 3 individual 8oz ramekins with coconut oil. Set aside. Tear apart the croissants into small pieces. 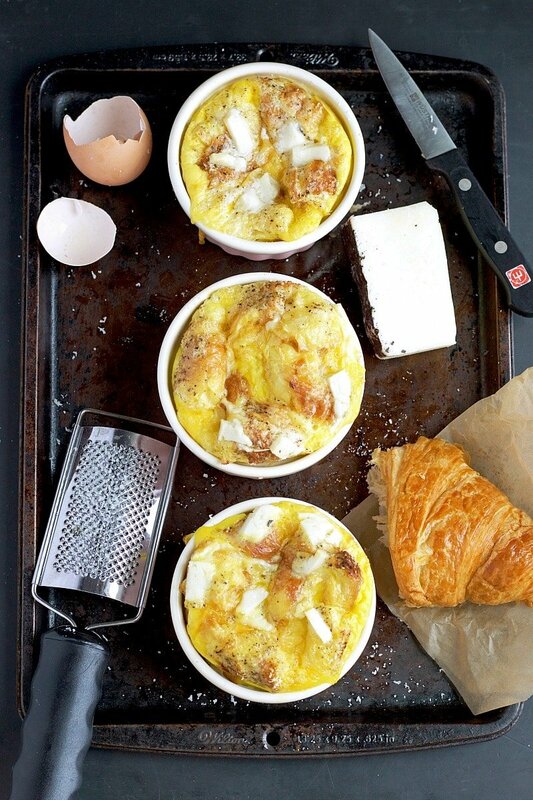 Fill each ramekins with the croissant pieces to the very top but don’t push it down. Pour the eggs into the ramekins until about ¾ of the way up. Add grated pecorino, season with salt and pepper and top with pecorino shavings. Bake for about 18-20 mins or until the soufflé rises and edge pieces start to turn brown.